Their 2015-16 season, including Barbican appearances with Nicola Benedetti and a performance in BBC’s Andriessen Total Immersion weekend, the world premiere of a new work by Kenneth Hesketh and a residency at the Fitzwilliam Museum, has left some big shoes to fill. BSA’s fifth year is more than up to the challenge. 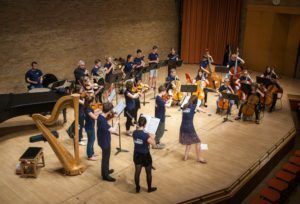 Cementing its place as the foremost chamber orchestral training opportunity for bright young talent from the east of England Britten Sinfonia is committed to nurturing the next generation of dynamic music-makers through BSA. Members have the chance to work with internationally acclaimed guest artists, commission new work, perform alongside their professional colleagues and take up the challenge as inspirational role-models to other young musicians. Sunday 16 October 2016 – pre-concert performance of Britten’s Suite on English Folk Tunes for the launch of Britten Sinfonia’s inaugural season as Resident Orchestra at Saffron Hall. January 2017 – Fitzwilliam Museum residency inspiring children including the premiere of a new work for children and families inspired by Edward Lear’s timeless poem, The Owl and the Pussycat. Saturday 25 February 2017 – BSA join Britten Sinfonia for a performance of Philip Glass’s Music in Similar Motion at the Barbican Hall in John Adams 70th Birthday Concert. July 2017 – BSA feature as a highlight of the award-winning At Lunch concert series with two performances in West Road Concert Hall (Cambridge) and St Andrew’s Hall (Norwich).